These are the closing lyrics from a song by of one of Detroit’s more unusual children, a city that also gave us Motown Records, General Motors, Jack White, Alice Cooper, Francis Ford Coppola and many other people and things. 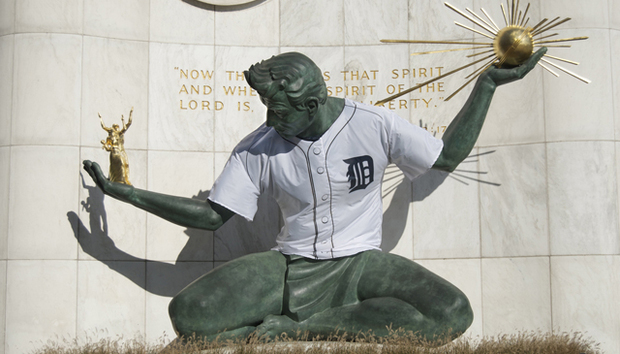 As has been documented elsewhere, Detroit is in trouble. Its city population has fallen from 1.85 million people in 1950 to a little over 700,000 in 2013. The town once known as the Motor City has filed for bankruptcy and at time of writing (15 December, 2013), it faced a crucial week in its efforts to make a quick escape from that bankruptcy. Across the city, an area the size of San Francisco lies broken and desolate but the forced entrepreneurship of its population means that there are now guided tours of these areas. Fluorescent-lit buildings show a beauty that is almost like the ruins of Pompeii, a necropolis of graffitied dreams. The East Side of Detroit, as Eminem says in the (excellent) movie Eight Mile, is where danger lies. Here, the zombies raised on crystal meth and crack will kill you for $5 in a place that makes the Baltimore projects in The Wire TV show look like palatial South Kensington in London. This is no place to set up a business. But, Detroit is not just about decline. The West Side of Detroit tells a very different story. The houses around Grosse Pointe opposite the Detroit River are opulent and the most expensive real estate in the state of Michigan. Over here you can see Canada, but you can also see the class struggle and the poverty line without ever having to experience it. It was the Irish genius James Joyce who said that “every new yard of West End creates an acre of East End” and Detroit defines this, but something else is happening and it is not coming from the extremes of the city; it is happening downtown. In the part of downtown around the Detroit Opera House (amazingly, still open), a thriving tech scene is transforming the area block by block as startups begin to expand and move out of the seminal M@dison Theater and into the buildings around it. Locals call this the ‘M@dison Effect’, a phenomenon that has attracted behemoths such as Google and Twitter to the city and now encompasses more than 40 blocks of young companies. Located at 1555 Broadway, the M@dison Theater was reopened in 2011, more than 80 years after it was originally built in 1917, at a time when Detroit was thriving and on its way to be third-largest city in the US. The buyer of the building was local boy Dan Gilbert who had made a fortune with Quicken Loans, the largest US online retail mortgage lender. Twelve months earlier, Gilbert had moved his Quicken Loans 1,700 employees to Detroit and started a series of investments that included the M@dison Theater to regenerate the downtown district. That statement has been backed up by the events of the past two years. Through Rock Ventures, the umbrella entity of Gilbert’s portfolio of companies, the company now owns more than 40 downtown properties totalling nearly 8 million square feet. Gilbert-owned businesses employ more than 11,500 people in the city. Detroit Venture Partners, a VC company of which Gilbert is a partner, is openly pugnacious in the way that it supports its portfolio of startup companies and styles itself as being “behind enemy lines while other VCs are enjoying their French-vanilla, no-whip, mocha Frappuccinos.” It works for me. This approach is certainly proving to be successful, not least in attracting hipsters who prefer to get their hands dirty away from the golden cages of Silicon Valley. The trend to working in Detroit means that there is now a waiting list for downtown apartments, where the average rent is inching up from $1,500 to nearly $2,000 per month. Crisis? What crisis? Even crime doesn’t faze local people. I was told that while people were “killed for nothing” over on the East Side. By contrast, the worst that can happen downtown is to be “Apple-picked” when an opportune mugger sees somebody on their iPhone/mobile and runs off with it. One startup based in the M@dison Theater is Chalkfly, a company that offers schools online office supplies. The company says its presence downtown is vital to its future. “The tech scene in the M@dison Building is collaborative, imaginative and innovative. Chalkfly has been able to grow because of the scene that is being created downtown and we are glad to be a part of it,” says Andrew Landau Chalkfly’s CEO. Another company that is emblematic of the M@dison effect is backstit.ch, which helps users build and create web content from their favourite sources. Backstit.ch moved out of the M@dison Theater as they expanded and did so at the same time as Bizdom, the startup accelerator with which they are associated. “The M@dison block community has seen some amazing growth in the past year. It started out as just a building with some desks and a bunch of one- to two-person companies. We've now spilled over to an entire block and at the same time developed a camaraderie that is really something special,” says Jordan Warzecha, CEO of backstitch. Entrepreneurs such as Warzecha and Landau are evidence of how Gilbert’s investments have transformed downtown and, while abandoned buildings can still be seen in and around the M@dison Block, the area feels safe, even if the lack of cars is sometimes disconcerting. These days the Motor City seems to be a city without cars. Who knew? But it also appears to be a city that is ready to cast off its black cloud in its exhaust fumes and rev up. In the future the city’s famous sons and daughters will be joined by Dan Gilbert, the man who may have saved a city. Or at least he may have saved the downtown part of the city: unfortunately, the East Side may be beyond him. Monty Munford has written about digital innovation for Wired, the Daily Telegraph and many other titles, often looking at the impact technology has on Africa and Asia. He runs his own site at www.mob76outlook.com and has also starred in Bollywood films.